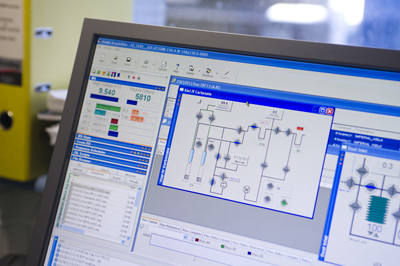 The carbonate group operates the "Qatar Stable Isotope Lab", which is equipped with new instrumentation purchased in part using research funds allocated to us by the Qatar Science and Technology Park (QSTP) in the framework of a $70 millions project on carbon capture and storage (QCCSRC). 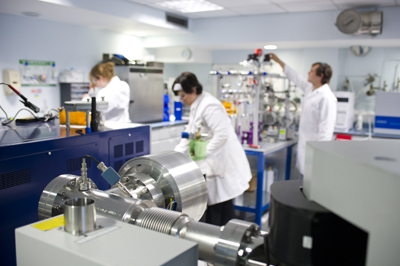 We currently operate one mass spectrometer that was installed in mid 2010. We specialise in both standard isotopes (δ18O and δ13C, more detailed below) and we also have facilities to measure the newer clumped isotope. For conventional isotopes, we operate a Thermo Finnigan MAT 253 equipped with a dual inlet (see photo on the right). This machine offers the best available linearity and acceleration voltage (10 Kv) for gas sourced mass spectrometry. It comes standard with three collectors registered for masses 44, 45 and 46, but our machine is also equipped with additional collectors to measure clumped isotopes. The lab is also equipped with a Kiel IV Carbonate device , which attached to the MAT 253 (photo on the left) allows us to measure traditional isotopes (δ18O and δ13C) on very small samples of carbonates (down to 20 µg or less). The precision (1σ) obtained on samples between 50-100 µg is typically ±0.03‰ for δ13C and ±0.05‰ for δ18O. The kiel device consist of a programmable oven maintained at 70°C, where orthophosphoric acid is reacted with the carbonate sample in individual vials. 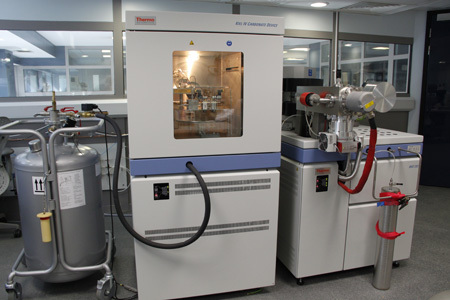 The resulting CO2 is then trapped in a cold finger and cleaned through a series of traps before being automatically loaded into the mass spectrometer for analysis. We typically use the kiel device to measure small samples such as individual cement phases for diagenesis, or foraminifers to study variation in ocean chemistry and climate. With the kiel device coupled to the MAT 253, we can analyse single foraminifers without compromising the accuracy of the results. Including samples and replicates, we generally manage to analyse 30 samples per run (i.e. about 24-28 hours). Our sample throughput is currently of ~6000 samples per year, and we estimate that this will dramatically increase once we receive a second instrument dedicated to conventional isotopes.